As a saxophone player in DeKalb’s very own Jazz In Progress, I welcome artistic inspiration as well as inspiration in the medical sense (drawing a breath). As someone with a chronic illness I’m grateful for the days when I can take a full, deep inhale and easily redirect a stream of air through my saxophone to bring a tune to life. Our breath both reflects and directly influences our stress level which is why nearly every stress management technique involves some advice about breathing. There are many phone apps available to help with stress, anxiety, and various breathing techniques, but Spire is among the first wearable devices to monitor breathing (and by extension) stress. It also monitors steps and general activity, but it is not designed to perform sleep tracking functions. You wear Spire close to the body—either on the waistband of your pants or on a bra. My spouse’s brief test of bra placement suggested that while comfort was not an issue, accuracy might be a problem. Therefore, we recommend waistband placement. I thought clipping what looks like a large pebble to the inside of my pants sounded like it could get uncomfortable, but I barely notice it. Occasionally, I’ll intentionally notice its presence to remind myself to “try to breath into the spot,” something therapists at Creative Therapeutics often suggest to loosen tension in the belly. When synced with a smartphone, the Spire device sends notifications with a gentle buzz. One kind of notification is based on “streaks.” Spire defines a streak as a minimum of two minutes of either tension (rapid or erratic breathing), focus (steady, moderately-paced breathing), calm (slow, smooth breathing) or activity (walking etc.). You can customize these notifications, but Spire bases the default settings on user data, so they suggest sticking with the defaults initially. Spire also sends notifications called summaries that tell you how you’ve done over a day or a week. A notification can tell you, for example, that you had a 15-minute calm streak to help you be more aware of what experiences or activities induce calm. Likewise, a notification might tell you that you had a few minutes of tension or focus to help bring your awareness to situations that lead to those states as they are happening. 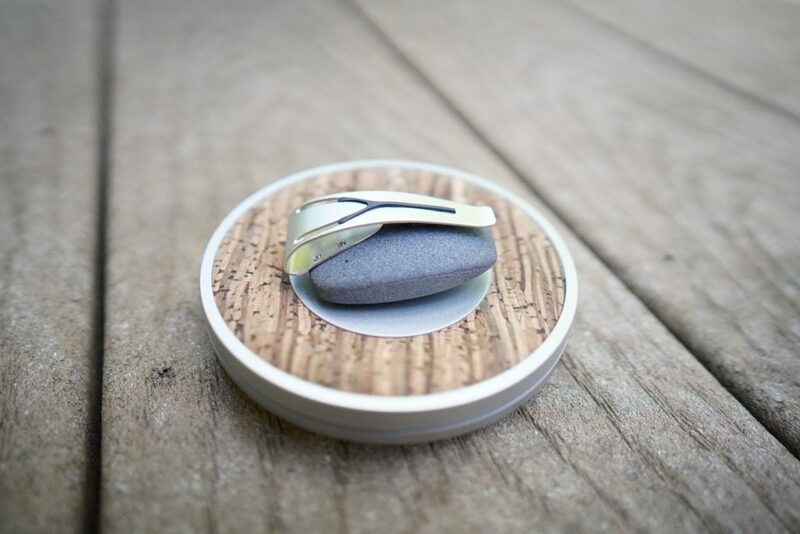 In addition to bringing your awareness to these states in real time, Spire provides “boosts” empowering you to develop breathing skills, focus, calm and mindfulness. The boosts are basically guided meditations ranging from 30 seconds to over 15 minutes. Some of the boosts are multifaceted provided by Dr. Deepak Chopra or the nuns of Tich Nhat Hanh’s Plum Village Monastery. As of this writing there are about 14 boosts and packs of boosts. Spire promises to add more in the future. Within minutes of trying my first boost, using their cues in conjunction with viewing my breath wave enabled me to make some immediate progress. That first meditation began the way many stress management meditations do—by encouraging you to take longer inhales and longer exhales. But it was what the meditation said next that really had an immediate impact—it suggested that instead of forcing it, just think about changing the timing of your breath by allowing your inhales to enter slowly and deeply. Over the next few weeks, I found these real time notifications particularly helpful for keeping stress levels in check. Recently, the Spire buzzed while I grappled with writing a diplomatic response to a challenging work-related email. I grabbed my phone, assuming Spire was going to tell me that I am tense. Instead, it indicated that I haven’t taken a deep breath in several minutes and asked if I’d like to do a 30-second boost. Then I realized that I was essentially holding my breath as I was formulating my response. Catching this behavior in the act most likely prevented unnecessary tension in the moment. While this product certainly hasn’t cured my irritable bowel syndrome, I believe it may be helping me cope with some of the symptoms. Catching moments of tension and periods where I haven’t taken a deep breath may very well prevent symptoms from getting worse than they need to be. The wireless charger is elegant and incredibly convenient. It includes an additional port to allow you to charge your phone through it simultaneously. That feature, however, seemed to work inconsistently with my iPhone 6 for some reason. This certainly shouldn’t be a deal-breaker. I initially ordered a similar device (http://prana.co), but manufacturing issues have slowed its release. The forthcoming Prana device offers posture monitoring, as well. If and when I receive the Prana, I will offer another review comparing the features and functionality of the two devices. In the meantime, I will enjoy the benefits of Spire. The great alto sax player Charlie Parker sums it up best: “If you don’t live it, it won’t come out of your horn.” In my case, that is true in a very literal sense. Monitoring instances of tension, focus and calm while recognizing patterns and taking actionable steps (boosts) changes how I live and ultimately what comes out of my horn. Guest writer Steve Estes is the Director of Academic Advising in the College of Liberal Arts & Sciences at NIU. He has advised students at NIU for over 20 years. He enjoys music, photography, the outdoors and Total Gym classes at Creative Therapeutics. This entry was posted in Publication and tagged stress management, spire, activity tracker, fitness, breathing, breath. Bookmark the permalink.